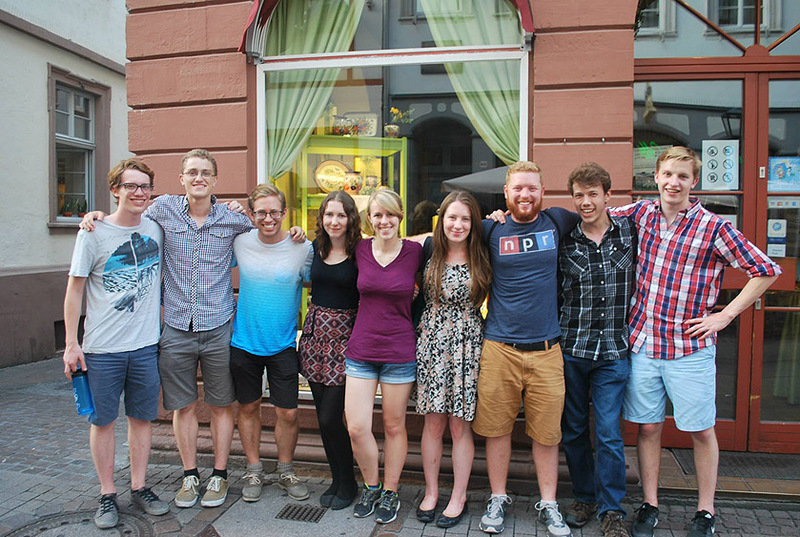 Claire Kaiser, at center, explores Heidelberg, Germany, with a group of Canadian, American and UK students she met through the DAAD-Rise program. At left below, Claire during a weekend trip to Amsterdam. 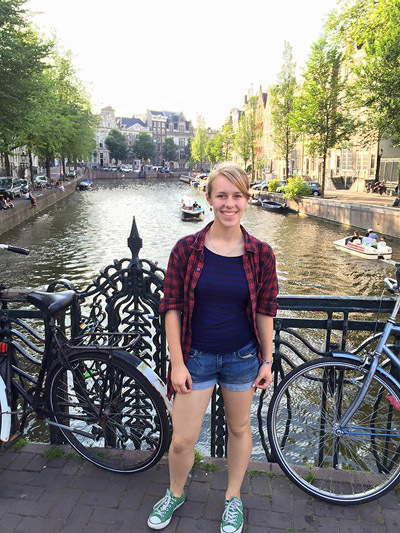 Sept. 11, 2015 -- “Every trip to the grocery store or to campus on the subway was such a departure from my normal life,” says Claire Kaiser, a sophomore in Biomedical Engineering who spent this summer as a DAAD-Rise scholar at Technischen Universität München (TUM) in Munich, Germany. And she got to do research in an area that interests her: medical imaging systems. RISE Germany is a summer internship program for undergraduate students from the United States, Canada and the UK in the fields of biology, chemistry, physics, earth sciences and engineering. As the program’s website notes, RISE Germany offers opportunities for bachelor students to work with research groups at universities and top research institutions across Germany for a period of 3 months during the summer. RISE Germany interns are matched with doctoral students whom they assist and who serve as their mentors. Stipends and housing are provided. As a result she gained a lot of exposure to a typical lab setting and the daily life of a Masters or PhD student, and also learned more computer programming and publication writing skills. Claire said she chose DAAD-Rise because “I was interested in studying abroad but didn’t have any time in my schedule to take a semester abroad due to my demanding major and minor. This program allowed me to have a study abroad experience over the summer by combining a research position/internship with travel.” It also appealed to her because of the stipend it provided.